Our small volume straw blower TX27XL or TX27XL POLYFLOW can be equipped as standard with a mechanical rotor S.D.E. This system for strug bale distribution gives you a straw blowing of very high quality. For the distribution of difficult products, we recommend the machine with a mechanical rotor S.D.E. 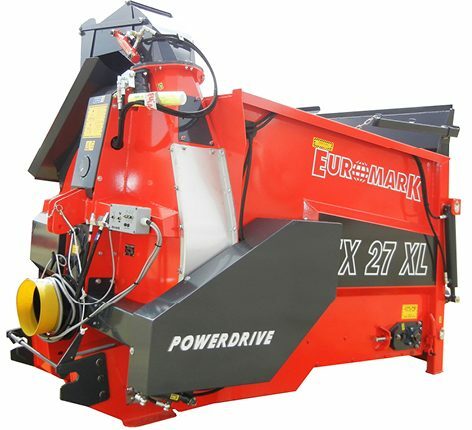 to be equipped with the clutch controlled feed rotor system POWERDRIVE – major innovation patented EUROMARK. A wide choice of options can be added to the machine in order to ensure an efficient and effective working tool, adapted to your daily needs. Mechanical separator S.D.E. // Strung Bale Distribution for straw distribution, grass wrapping, short strands fodder,… All-fodder feed rotors are mechanically taken away by the belt. 550mm in diameter, these feed rotors have sharp sections, which cut grass bale. Spiral-positioned injectors on the feed rotor propel materials into the turbine. Long fibre don’t twist thanks to the large diameter of the feed rotor. A comb regulates the straw’s inflow, or the fodder’s, into the turbine. 320° Rotating chute (optional) // To deal with complexe buildings configuration, small volume straw blower TX27XL POLYFLOW can be equipped with a 320° rotating chute to mulch up to 15m far. Its 3-elements conception gives the possibility to mulch close to the edge of the machine. Lateral chute , mulcingh between 18 to 20m far (depending on straw quality). POLYFLOW central chute, mulching up to 15m far in hardly accessible areas (depending on straw quality). Mounted version, to offer you excellent manoeuvrability’s advantages.